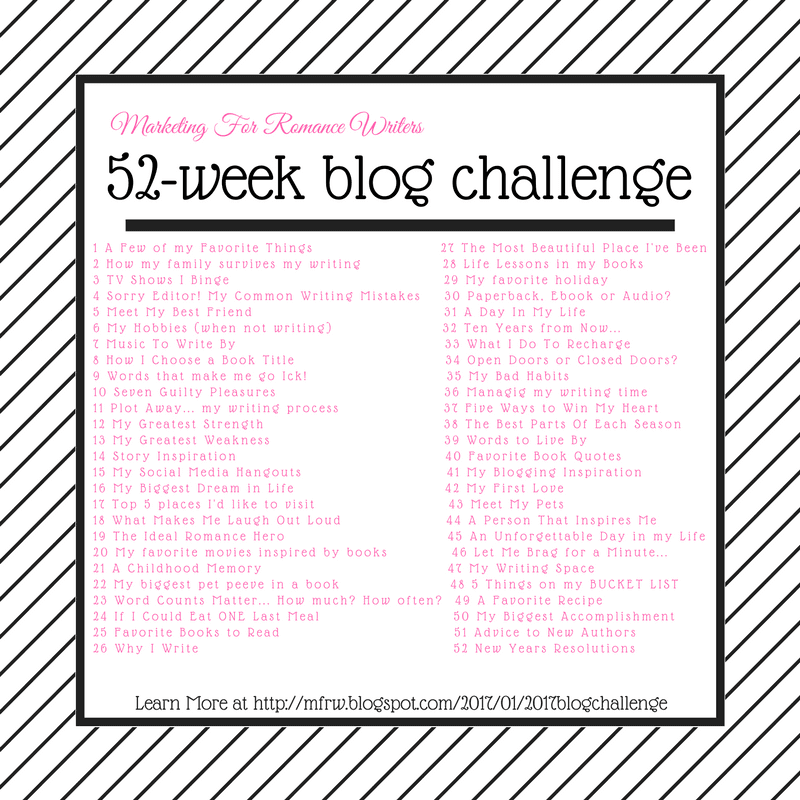 Welcome back to the MFRW52weekblogchallenge. It is week 31 and out the topic is A Day In My Life. I am going to do this in two parts as my norm has been disrupted. I am staying with my Dad in Hannibal Mo right now helping him deal with some medical issues. So here is our day. Get up around 630 make coffee, help him get his blood sugar tested then cook his breakfast. We watch old game shows from the 70’s or sports center until 11 when his soap opera comes on and his lunch comes. In the meantime, I try to keep up my reviews, type my blogs, listen to audio books or read if I can. That’s if there aren’t Dr. appointments, tests, dietitians, diabetes meetings, therapy, etc. I try to cook dinner around 5, clean up and sit down by 7 when we watch Tv an around I try to read till 11130. Now that he is on his feet and adjusting to diabetes I will be going home next week, though life won’t get back to normal for a couple months since my daughter and her daughter will be moving in for a while before moving to Iowa. Then I get to write for a few hours. Around lunch, I go out work in the yard or do housework till about 5 then cook dinner. After that, I like to get my shower and lay down to read. Let’s go see a day in the other Authors lives. I’m sure your dad appreciates you interrupting your own life to help him, and your daughter and granddaughter will appreciate being able to stay with you. Enjoyed your post. Thank You, Sherry! He has always been there for me so I am here for him! Live is never normal is it? Your dad will always remember you came to help him, Cathy. Sending good thoughts to you and your dad, and hoping he gets used to taking care of his diabetes. Sounds like he’s doing well if you’re leaving soon. Wow, it will really be different when you go back home with extra family there. YIt seems one thing after another here lately but it is all good! I can’t wait to spend time with the youngest granddaughter. It sounds like your family’s support system is strong. That is so important. Even though three of my kids live 2000 miles or more away, we still try to be there for each other. It’s wonderful of your to help your dad get used to his new health regime. It’s good of you to stay with your dad and help him adjust to his diabetes. I miss my mom and dad a lot. Enjoy time with the granddaughter. It’s great that you’re helping your dad, Cathy. It means so much to him, I know. I just lost my dad this spring and I treasure the time I got to spend with him. Enjoy your daughter and granddaughter, too! Big hugs for your loss. I have had a nice visit. My life is just as boring. It is what it is. Good to hear your dad is adjusting and can be on his own again. I think boring is good lol it means less drama! He is so lucky to have a doting daughter and you to have a loving father. You get an amazing amount of work done, too!